This make for a handy reference guide to all your styles, but can be a bit cumbersome to setup, especially if you have a big stylesheet. 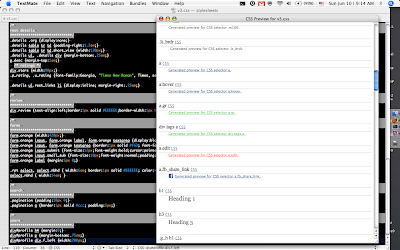 Today I discovered an awesome feature of Textmate that automates this whole process. When editing your stylesheet in Textmate, use the Show Web Preview command ( ctrl + option + ⌘ + p ) to generate a list of all your different styles. I discovered this via this post on tumblr.